Bishop Vincent Long OFM Conv (centre), Fr John Hogan (centre right) and seminarians from the Holy Spirit Seminary. Image: Alphonsus Fok/Diocese of Parramatta. Holy Spirit Seminary, Harris Park celebrated the commencement of the 2019 academic year with a Mass at St Patrick’s Cathedral, Parramatta on Sunday 24 February 2019. 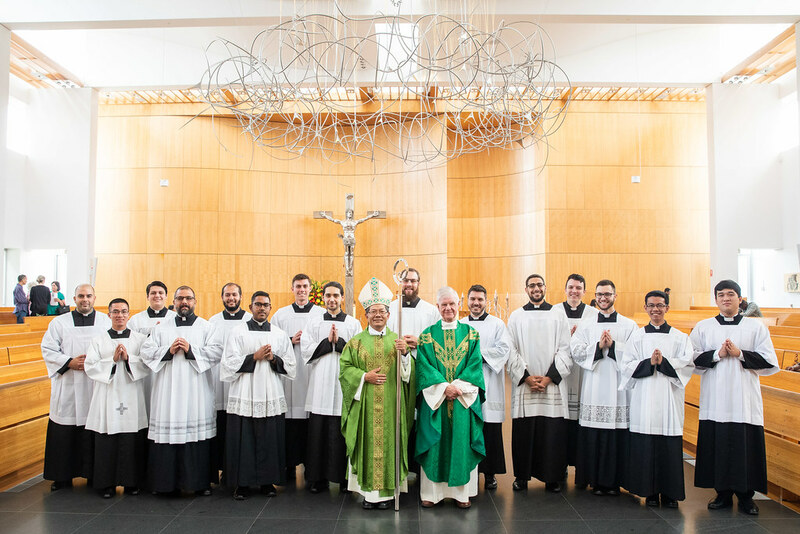 Holy Spirit Seminary this is year is blessed with five new seminarians – Alexander Kurkcu, Luke Huynh Thien Quoc, Elias Saleh, Matt Ramirez and Peter Lam. View images from the Opening of the Seminary Year here. Most Rev Vincent Long OFM Conv, Bishop of Parramatta was the principal celebrant of the Mass. Concelebrating was Very Reverend Bob Bossini, Dean of the Cathedral, Fr Chris del Rosario, Assistant Priest of St Patrick’s Cathedral, Fr John Hogan, Rector of the Holy Spirit Seminary, Fr Pawel Barszczewski OP, Spiritual Director of the Holy Spirit Seminary and Fr Francis Nguyen from the Archdiocese of Sydney. Seminarians were the servers and the readings were proclaimed by members of the St Patrick’s Cathedral Parish. During his homily, Bishop Vincent said that the Gospel reading (Lk 6: 27-38) pushed the vulnerability of discipleship, and how the seminarians are called to listen with an open heart. “In today’s episode, Jesus pushes the vulnerability of discipleship to fresh extremes. He stretches the limits of love and redefines its meaning in the process. ‘You have learnt how it was said: eye for eye and tooth for tooth. But I say this to you: Offer the wicked man no resistance.’ This and similar commands like ‘love your enemy and pray for those who persecute you’ seem unrealistic and unachievable in the age of terrorism. “Yet, disarming violence with non-violence and especially by benevolence is precisely the fundamental ethics of the Kingdom. It is at the core of Jesus’ teaching and therefore the core of Christian discipleship. We are challenged to go beyond the letter of the law, beyond the minimum requirements to loving others at our own cost. We can do so on the basis of knowing ourselves to be enriched by the divine generosity and therefore to act with such generosity towards others is not impossible. Bishop Vincent Long OFM Conv during the Mass for the Opening of the Seminary Year. Image: Alphonsus Fok/Diocese of Parramatta. “Today, we especially pray for our seminarians as they begin their academic year. We are truly blessed with these young men who have committed themselves to a journey of vocational discernment. I am deeply indebted to the formation team led by Fr John Hogan, the Rector of our Holy Spirit Seminary. “Seminarians are formed with the people and for the people, not for themselves. Therefore, I invite all God’s people in the diocese to be the extended formation community for these young men. You do so by your prayer, support and when and where possible, even accompaniment. “I firmly believe that shepherding is not a one-way street. The shepherd remains not apart from, but, a part of the faith community. Though he preaches, he listens with open heart to the preaching of others. Though he blesses, he also bows his head to receive the blessings of others. Though he leads with a leadership of service, he must be willing to be led by others. Though he ministers, he also recognises the ministerial charisms in others and works with them in collaborative ministry for the good of the community. “The Kingdom vision of Jesus guides all of us as we endeavour to be a community that reflects the divine pathos and compassion. In the post-Royal Commission society, we Catholics cannot be a credible force for good if we persisted in the culture of clerical power, status and privilege. A celebratory lunch was held in the Cathedral Hall following Mass for the seminarians, their families and friends. View images from the Opening of the Seminary Year here or below.